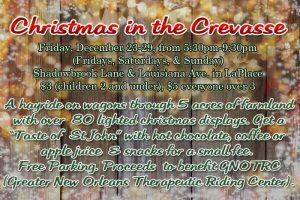 If you are interested in a little different fun for this weekend, you may want to check out Christmas in the Crevasse. Have you ever been on a hayride? If not, or maybe you just want to go again, this is definitely a wonderful experience. First, you need to gather up a blanket combined with some christmas spirit. Then, head on over to Laplace where you will find 5 acres of farmland covered with over 80 lighted Christmas displays. The hayrides last about half an hour and depart every 15 minutes. There will also be hot chocolate, coffee, apple juice, and snacks available for a small fee. All of the proceeds benefit the Greater New Orleans Therapeutic Riding Center. The Greater New Orleans Therapeutic Riding Center is a non-profit organization that was founded to help provide a fun and therapeutic experience for individuals with physical, emotional and learning disabilities. GNOTRC is a Professional Association of Therapeutic Horsemanship (PATH International) member operating center.